If there is ever a rise of the machines, and the only way to beat them is by playing poker, we may be in trouble. At Pittsburgh’s Rivers Casino, during the last two weeks, human minds were put to the test against an artificial intelligent bot at playing Texas Hold’em. The team of great poker players barely won, proving how powerful A.I. can be. 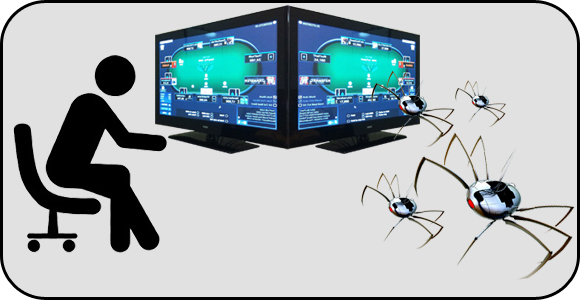 There were four top poker players on the human side playing against one bot called Claudico. They played a total of 80,000 hands of Heads-Up No-Limit Texas Hold’em, and by the end of the two weeks, 3 out of the 4 players had more money than the bot; their total was $732,713 above what Claudico had. The player breakdown of how much each player had above Claudico is: Bjorn Li by $529,033, Doug Polk by $213,671, and Dong Kim by $70,491; Jason Les came $80,482 under Claudico. A total of $170 million was bet during this contest, and according to the statistics, the human monetary edge is less than half percent; which would seem to make it a tie. However, Doug Polk considers that it was still a victory for the human side, seeing as how they managed to have more money at the end than the bot. All players did commend Claudico for being a formidable opponent, being balanced and strong. You can read more on the Brains vs. Artificial Intelligence poker competition and see if you would stand a chance against this incredible bot.